I just ordered a copy of this book and hope to report on it in more detail later. 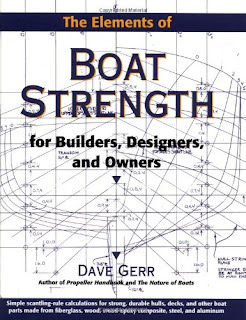 I have read most of Dave Gerr's other book, The Nature of Boats and found that one helpful. So I'm hoping that this one will be as well. 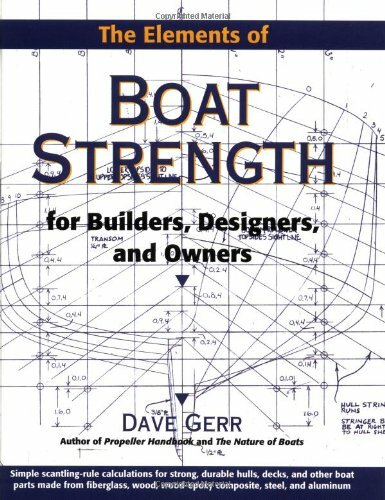 Dave Gerr is a professional boat designer and explains the major issues that a boat designer has to deal with in easy to understand terms in the Nature of Boats. In this particular book, he gets into the details of how strong you have to make boat parts so the boat doesn't break. Strength isn't much of an issue for kayak builders. Long as you follow traditional guidelines the boats will be strong enough. Most of the time, most kayak builders that I know want to make their boats as light as possible for ease of transport. You can push that envelope all you want. If a boat breaks, it's no big deal for the most part since you didn't put much money into it in the first place and with a skin on frame boat, breakage of frame parts is seldom catastrophic or life threatening. Not so if you build bigger boats. More money is at stake and maybe lives and cargo and professional reputations, so it behooves the big boat builder to have some notion of how strong is strong enough. The book will soon be on its way and I will report on whether any of the material in it will benefit the average skin on frame kayak builder.